What is Dhyana – Meditation? M: The word dhyana usually signifies meditation on some object, whereas nididhyasana is used for enquiry into the Self. The triads persist until the Self is realised. Dhyana and nididhyasana are the same so far as the aspirant is concerned, because they involve trinity and are synonymous with bhakti. M: Dhyana is holding on to a single thought and putting off all other thoughts. D: How should dhyana be practiced? M: Dhyana serves to concentrate the mind. The predominant idea keeps off all others. Dhyana varies according to the individual. It may be on an aspect of God, on a mantra, or on the Self, etc. M: To stick to a position unassailed by thoughts is practice, you are watchful. But the condition grows intenser and deeper when you effort and all responsibilities are taken away from you; that is Aroodha, Siddhi state. M: Concentrate on that one whom you like best. If a single thought prevails, all other thoughts are put off and finally eradicated. So long as diversity prevails there are bad thoughts. When the object of love prevails only good thoughts hold the field. Therefore hold on to one thought only. Dhyana is the chief practice. Dhyana means fight. As soon as you begin meditation other thoughts will crowd together, gather force and try to sink the single thought to which you try to hold. The good thought must gradually gain strength by repeated practice. After it has grown strong the other thoughts will be put to flight. This is the battle royal always taking place in meditation. One wants to rid oneself of misery. It requires peace of mind, which means absence of perturbation owing to all kinds of thoughts. Peace of mind is brought about by dhyana alone. D: Meditation is with mind and how can it kill the mind in order to reveal the Self? M: Meditation sticking to one thought. That single thought keeps away other thoughts; distraction of mind is a sign of its weakness. By constant meditation it gains strength, i.e., to say, its weakness of fugitive thought gives place to the enduring background free from thoughts. This expanse devoid of thought is the Self. Mind in purity is the Self. D: How is meditation to be practised? M: Meditation is, truly speaking, is to be fixed as the Self. But when thoughts cross the mind and an effort is made to eliminate them the effort is usually termed meditation. Fixity in the Self is your real nature. Remain as you are. That is the aim. D: But thoughts come up. Is our effort meant to eliminate thoughts only? M: Yes. Meditation being on a single thought, the other thoughts are kept away. D: We are asked to fix the mind in the Self. But the Self is unthinkable. M: When all thoughts are eliminated it becomes fixed in the Self. D: How is Vichara to be done? M: The questioner must admit the existence of his Self. “I AM” is the Realisation. To pursue the clue till Realisation is Vichara. Vichara and Realisation are the same. D: It is elusive. What shall I meditate upon? M: Meditation requires an object to meditate upon, whereas there is only the subject without the object in vichara.Meditation differs from vichara in this way. D: Will vichara alone do in the absence of meditation? M: Vichara is the process and the goal also. ‘I AM’ is the goal and the final Reality. To hold to it with effort is vichara. When spontaneous and natural it is Realisation. D: In my meditation I try to eliminate the wrong ‘I’, but so far without success. M: How can ‘I’ eliminate itself? All you have to do is to find its source and abide in it as your real Self. Your efforts can extend thus far, the Beyond will take care of itself. D: Bhagavan, you always say that the Self is ever present; if I am present then why do I not feel it? M: Yes, it will take you up. You must do it with a calm mind – mental calmness is essential. D: How does that consciousness manifest itself when that centre – the Heart – is reached? Will I recognise it? M: Certainly, as pure consciousness, free from all thoughts. It is pure unbroken awareness of your Self, rather of pure Being – there is no mistaking it when pure. D: If I go on rejecting thoughts, can I call it Vichara? M: It may be a stepping stone. But really Vichara begins when you cling to your Self and are already off the mental movement, the thought-waves. D: Then Vichara is not intellectual? M: No, it is inner quest. D: Is not meditation better than investigation? M: Meditation implies mental imagery, whereas investigation is for the Reality. The former is objective, whereas the latter is subjective. D: What are the hindrances to Self-realisation? M: Memory chiefly, habits of thought, accumulated tendencies. D: How to get rid of these hindrances? M: Seek the Self by meditation in this manner. Trace every thought to its origin which is only the mind. Never allow thought to run on. If you do, it would be unending. Take it back to its starting place again and again and the mind would die of inaction. Go back constantly to question ‘Who am I?” Tear everything away until only the source of all is left. And then live always in the present, only in it. There is no past or future except in the mind. M: True. But the very fact that you are possessed of the quest of the Self is a manifestation of the divine grace. It is effulgent in the Heart, the inner being, the Real Self. It draws you from within. You have to attempt to get in from without. Your attempt is Vichara (earnest – quest), the deep inner movement is Grace. That is why I say there is no real Vichara without Grace, nor is there Grace active for him who is without Vichara. Both are necessary. D: What is the paramount duty of a human being caught up in the cycle of births and deaths? Please decide on one and expound it to me. M: For those desiring the highest, discerning one’s own true nature is most important. It is the basis of all actions and their fruits. D: Briefly by what spiritual practice does one become aware of one’s own true nature? What effort brings about the exalted inner vision? M: Withdrawing all thoughts from sense objects through effort one should remain fixed in steady non-objective enquiry. D: Other thoughts arise more forcibly when you attempt meditation.There was immediately a chorus of questions by a few others. M: Yes, all kinds of thoughts arise in meditation. It is but right. What lies hidden in you is brought out. Unless they rise up how can they be destroyed? They therefore rise up spontaneously in order to be extinguished in due course, thus to strengthen the mind. D: What should one think of when meditating? M: What is meditation? It is expulsion of thoughts. You are perturbed by thoughts which rush one after another. Hold on to one thought so that others are expelled. Continuous practice gives the necessary strength of mind to engage in meditation.Meditation differs according to the degree of advancement of the seeker. If one is fit for it one might directly hold the thinker; and the thinker will automatically sink into his source, namely Pure Consciousness.If one cannot directly hold the thinker one must meditate on God; and in due course the same individual will have become sufficiently pure to hold the thinker and sink into absolute Being. D: What is to be meditated upon? M: Anything that you prefer. D: Siva, Vishnu, and Gayatri are said to be equally efficacious. Which should I meditate upon? M: Anyone you like best. They are all equal in their effect. But you should stick to one. D: There is something concrete necessary to meditate upon. How shall we meditate upon ‘I’? M: We have become rooted in forms and so we require a concrete form for meditating upon. Only that which we contemplate will in the end remain ever. When you contemplate the other thoughts disappear. So long as you need to contemplate there are other thoughts. Where are you? You contemplate because you exist. For the contemplator must contemplate. The contemplation can only be where he is. Contemplation wards off all other thoughts. You should merge yourself in the source. At times we merge in the source unconsciously, as in sleep, death, swoon, etc. What is contemplation? It is merging into the source consciously. Then the fear of death, of swoon, etc. will disappear, because you are able to merge into the source consciously. D: What is the best way to meditate? M: Do you do japa by rolling beads? M: Have you thought of God, His qualities, etc.? D: I have read, talked, etc. about such themes. M: Well, if the same be revolved in the mind without open expression through the senses it is meditation. M: After the camphor burns away no residue is left. The mind is the camphor; when it has resolved itself into the Self without leaving even the slightest trace behind, it is Realisation of the Self. D: In meditation are there words to be repeated mentally? M: What is meditation but mental repetitions of a concept? It is a mental japam which begins with words and ends in the Silence of the Self. D: I am taught that Mantra Japam is very potent in practice. M: The Self is the greatest of all mantras, and goes on automatically and eternally. If you are not aware of this internal mantram, you should take to do it consciously, as japam, which is attended with efforts to ward off all other thoughts. By constant attention to it you will eventually become aware of the internal mantra, which is the state of Realisation, and is effortless. Firmness in this awareness through repeated practice will make your mind hold on uninterruptedly and effortlessly to the current however much you may be absorbed in external activities. Listening to Veda chanting and other similar mantras has the same result as conscious repetitions of japam – its rhythm is the japam. M: What is gayatri? It really means : “Let me concentrate on that which illumines all”. Dhyana really means only concentrating or fixing the mind on the object of dhyana. But meditation is our real nature. If we give up other thoughts what remains is ‘I’ and its nature is dhyana or meditation or jnana, whichever we choose to call it. What is at one time the means later becomes the end; unless meditation or dhyana were the nature of the Self it could not take you to the Self. If the means were not of the nature of the goal; it could not bring you to the goal. D: Can I use forms and images of God and mantras? M: Yes, of course. All these things can help, or why should they be recommended in the books? Various things are prescribed to suit various natures. Each person must choose what seems easiest and appeals to him most. D: I have faith in murti dhyana (worship of form). Will it not help me to gain jnana? M: Surely it will. Upasana helps concentration of mind. Then the mind is free from other thoughts and is full of the meditated form. The mind becomes it – and thus quite pure. Then think who is the worshipper. The answer is ‘I’ i.e., the Self. So the Self is gained ultimately. D: I get into a trance when I see a sky like blank. M: He who sees the blank is the Self. D: It is so difficult to understand self-enquiry. If something concrete is said, it can be readily grasped. Japa, dhyana, etc., are more concrete. M: ‘Who am I?’ is the best japa. D: Meditation is possible only with control of mind, which can be achieved only through meditation. Is this not a vicious circle? M: They are interdependent: in fact meditation includes mind control, the subtle watchfulness against intruding thoughts. In the beginning efforts for control are greater than for actual meditation, but in due course meditation wins and becomes effortless. D: How to check the mind? M: Will a thief hand over a thief? Will the mind find itself? The mind cannot seek the mind. You have ignored what is real and are holding on to the mind which is unreal and also try to find what it is. Was there mind your sleep? it was not. It is now here. It is, therefore impermanent. Can the mind be found by you? Mind is not you. You think you are the mind, and, therefore, ask me how it is checked. If it is there, it can be checked. But it is not.Understand this truth by search. Search of unreality is useless. Therefore, seek the reality, i.e., the Self. That is the way to rule over the mind. There is only one thing real. The others are only appearances. Diversity is not its nature. We are reading the printed characters on paper but ignore the paper which is the background. Similarly you are taken up by the manifestations of mind and do not hold the background. Whose fault is it?The essence of the mind is only awareness or consciousness. When the ego, however, dominates it, it functions as the reasoning, thinking or sensing faculty. The cosmic mind being not limited by the ego, has nothing separate from itself and is therefore only aware. D: How is one to be aware of the cosmic mind? M: Hold the mind firmly and trace it back. By concentration mauna results. When practice becomes natural it will end in mauna. Meditation without mental activity is mauna.Merging of mind in its source is meditation; deep meditation; deep meditation is eternal speech. D: I am hard-worked and find little time to practise concentration. Are there any aids for it? Is control of breath a good aid? M: Prana and mind arise from the same source. The source can be reached by holding the breath or tracing the mind. If you cannot do the latter the former will no doubt be helpful. Regulation of breath is gained by watching its movements.If the mind is watched thoughts cease. Peace results and it is your true nature. King Janaka said “I have now found the robber (namely the mind) who has been robbing me of my ‘I’-ness. I will instantly kill this thief.” The perturbation owing to thoughts appears to rob the Self of its peace. The perturbation is the mind. When that ceases the mind is said to take flight. The Self remains as the undisturbed substratum. D: Is breath-control necessary for enquiry? D: “There is a blankness intervening”, it is said in the book. M: Yes. Do not stop there. See for whom the blankness appears. D: For devotees there is no blankness, it is said. M: Even there, there is the latent state, laya; the mind wakes up after some time. D: Is Hatha Yoga necessary? M: It is one of the aids – not that it is always necessary. It depends upon the person. Vichara surpasses pranayama. In “Yoga Vasistha” Chudala advises investigation (vichara) to Sikhidvaja for killing the ego.Reality can be reached by holding on to prana or intellect. Hatha Yoga is the former; Vichara is the latter. D: How to prevent falling asleep in meditation? M: Sleep must be gotten rid of, for the natural state has to be obtained consciously in jagrat, the waking state. Waking and sleeping are mere pictures on the screen of the native, thought-free, state. D: What is the difference between meditation and enquiry into the Self? M: Meditation is possible only if the ego be kept up. There is the ego and the object meditated upon. The method is indirect. Whereas the Self is only one. Seeking the ego, i.e., its source, ego disappears. What is left over is the Self. This method is the direct one. D: Then what am I to do? M: To hold on to the Self. M: Even now you are the Self. But you are confounding this consciousness (or ego) with the absolute consciousness. This false identification is due to ignorance. Ignorance disappears along with the ego. Killing the ego is the only thing to accomplish. Realisation is already there. No attempt is needed to attain realisation. For it is nothing external, nothing new. It is always and everywhere – here and now too. D: What is that one thing, knowing which all doubts are solved? M: Know the doubter. If the doubter be held, the doubts will not arise. Doubts must be uprooted. This means that the doubter must be uprooted. Here the doubter is the mind. D: What is the method? M: ‘Who am I?’ is the investigation. D: May we perform japa? M: Why should you think I am this? Investigate and the thoughts cease. What is, namely the Self, will be revealed as the inescapable residue. D: I am a beginner in meditation, and pray to Bhagavan to guide me. You exhort us to go on enquiring ‘Who am I?’ May I know where it will lead me? M: It is not mere asking; you must go to the meaning of it. Many meditate on certain centres in the body till they merge in them, but sooner or later they will have to enquire into their own nature, which is unavoidable. Then why not straightaway concentrate on yourself till you merge in its source? D: Yes, for twenty years I have been concentrating on certain chakras and have been seeing things and hearing sounds, but I got nowhere nearer the Truth. Now shall I go on asking ‘Who am I?’ as soon as a thought arises in my mind? M: Quite so. As long as you are not disturbed by outside thoughts dwell on its meaning. The aim is to reach undisturbed the root of the ‘I’-sense. D: We are advised to concentrate on the spot in the forehead between the eyebrows. Is it right? M: Everyone is aware, ‘I am’. Leaving aside that awareness one goes about in search of God. What is the use of fixing one’s attention between the eyebrows? It is mere folly to say that God is between the eyebrows. The aim of such advice is to help the mind to concentrate. It is one of the forcible methods to check the mind and prevent its dissipation. It is forcibly directed into one channel. It is a help to concentration.But the best means of realisation is the enquiry “Who am I?” The present trouble is to the mind and it must be removed by the mind only. 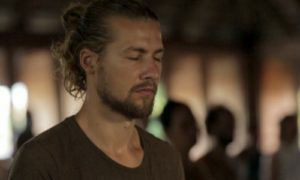 D: Has closing the eyes during meditation any efficacy? M: The eyes can be closed or open as one finds convenient. It is not the eyes that see. There is one who sees through the eyes. If he is turned inwards and is not looking through the eyes they can be open and yet nothing will be seen. If we keep our eyes closed it is the same to us whether the windows of this room are open or shut. D: Suppose there is some disturbance during meditation, such as mosquito bites, should one persist in meditation and try to beat the bites and ignore the interruption or drive the mosquitoes away and then continue the meditation? M: You must do as you find most convenient. You will not attain mukti simply because you refrain from driving away the mosquitoes, nor be denied mukti simply because you drive them away. The thing is to attain one-pointedness and then to attain mano-nasa. Whether you do this by putting up with the mosquito bites or driving the mosquitoes away is left to you. If you are completely absorbed in your meditation you will not know that the mosquitoes are biting you. Till you attain that stage why should you not drive them away? D: How to do all this? M: The lack of the feeling that we are the Self is the root cause of the trouble. Leave off thoughts and be, just be. It is the thoughts alone that create the hindrance; they are the trouble. Find out to whom the thoughts occur, so long as you think that an individual self exists, it will appear to do so, but find out where it arises and it will go.Those who have discovered great Truths, have done in the still depth of the Self. D: I get a headache if meditation be prolonged for some time. What should I do? M: If the meditator and meditation be understood to be the same there will be no headache or similar complaints. D: But they are different. How shall we consider them to be the same? M: That is due to your outlook. There is only one and there are no differences. On meditation the relative consciousness will vanish. That is not annihilation; for absolute consciousness arises. The Bible itself says, “The Kingdom of Heaven is within you”… If you consider yourself to be the body there is some difficulty in understanding the statement. On the other hand, if you know who you really are, the Kingdom of Heaven and all are included in your true Self. D: Bhagavan, each time I meditate, I feel a great heat in the head, and if I persist my whole body burns. What is the remedy? M: If concentration is made with the brain, hot sensations and even headache ensue. Concentration has to be made in the heart, which is cool and refreshing. Relax and your meditation will be easy. Keep your mind steady by gently warding off all intruding thoughts, but without strain – soon you will succeed.